Administrative law – Natural justice – Duty of fairness – Procedural fairness – Civil procedure – Appeals – Certification of a serious issue – Immigration law – Hearings – Re-opening hearing – Right to a fair hearing. Application for judicial review of decision of Refugee Board. The applicants, a family, arrived in the US on the father’s business visa. 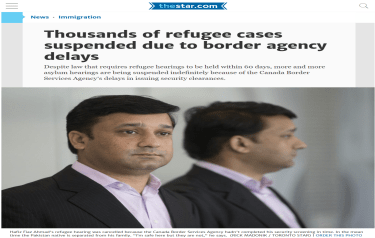 They failed to get an extension of the visa and arrived in Canada, claiming refugee protection. The children became ill and the father became concerned that his personal information form would not be submitted within 28 days. The solicitor told him that if the forms were submitted before an abandonment hearing then the claims were unlikely to be declared abandoned. The forms were not filed within 28 days and although a request for an extension was made no response was received. The refugee claims were declared abandoned. The applicants applied to have their case reopened. Their application was dismissed. They then applied for judicial review of the decision not to reopen their claims. HELD: Application allowed. The Board’s decision was set aside. Given the very serious significance of the abandonment decision, the applicants were entitled to meaningful reasons for the decision. The reasons given were neither meaningful nor sufficient. This was a breach of procedural fairness and therefore the Board’s decision was set aside and sent back to the Board for reconsideration. Immigration and Refugee Protection Act, s. 72(1). Refugee Protection Division Rules, Rules 44, 55. Max Berger, for the applicants. O’KEEFE J.:- This is an application for judicial review pursuant to subsection 72(1) of the Immigration and Refugee Protection Act, S.C. 2001, C. 27 (“IRPA”), of a decision of the Refugee Protection Division of the Immigration and Refugee Board (the “Board”) dated September 11, 2003 wherein the applicants’ motion to reopen their refugee claim was dismissed. An order sending the applicants’ claim to Convention refugee status back to the Board for redetermination. The applicant, Amer Javed (the “principal applicant”) arrived in the U.S.A. on July 15, 2000 on a U.S. business visa. His family, the remaining applicants, arrived in the U.S.A. two months later. A consultant who was supposed to obtain an extension of the principal applicant’s U.S. business visa failed to obtain the extension. The applicants arrived in Canada on March 6, 2003 and their refugee claim was referred to the Refugee Protection Division on March 6, 2003. The principal applicant received his Personal Information Form (“PIF”) on that date. On March 11, 2003 the principal applicant retained counsel and the same day, counsel requested a copy of the port of entry notes (the “notes”) in order to assist in the preparation of the PIF. In the interim, the principal applicant’s two children became ill and he took them to the doctor on March 17, March 24 and April 2, 2003. On March 31, 2003, counsel’s secretary again requested the notes. The principal applicant was concerned about his PIF not being filed within 28 days of him receiving the form on March 6, 2003. His solicitor told him that as long as the PIF was submitted in advance of any abandonment hearing, the claims were unlikely to be declared abandoned. The applicants’ counsel wrote to the Board on March 25, 2003, requesting an extension of time to complete the PIF. No response was received to this request. The applicants were given a notice to appear with respect to the abandonment of their claim for refugee protection on April 8, 2003, as no PIF was filed within 28 days of receipt. The abandonment hearing was to be held on May 7, 2003. The PIF was completed following the arrival of the notes and was submitted to the Board by mail on April 24, 2003. The principal applicant and a paralegal attended the abandonment hearing. The principal applicant stated at the abandonment hearing that the PIF was late because it took time to obtain counsel and the notes were late. The refugee claims of the applicants were declared abandoned. On July 21, 2003, the Board received an application from the applicants’ counsel to have their claim reopened pursuant to Rules 44 and 55 of the Refugee Protection Division Rules. The application to reopen was dismissed on September 11, 2003. The applicants stated that they have always wanted to continue with their refugee claims. This is the judicial review of the decision of September 11, 2003 refusing to reopen the claims for refugee protection. Did the Board make a reviewable error in refusing to reopen the applicants’ abandoned claim? A claimant or the Minister may make an application to the Division to reopen a claim for refugee protection that has been decided or abandoned. The application must be made under rule 44. A claimant who makes an application must include the claimant’s contact information in the application and provide a copy of the application to the Minister. The Division must allow the application if it is established that there was a failure to observe a principle of natural justice. Le demandeur d’asile ou le ministre peut demander à la Section de rouvrir toute demande d’asile qui a fait l’objet d’une décision ou d’un désistement. La demande est faite selon la règle 44. Si la demande est faite par le demandeur d’asile, celui-ci y indique ses coordonnÃ©es et en transmet une copie au ministre. La Section accueille la demande sur preuve du manquement un principe de justice naturelle. Counsel and claimants may disagree with the RPD decision but they have not, in my opinion, shown that the decision to declare their claims abandoned breached natural justice. In my opinion, it is now appropriate to recognize that, in certain circumstances, the duty of procedural fairness will require the provision of a written explanation for a decision. The strong arguments demonstrating the advantages of written reasons suggest that, in cases such as this where the decision has important significance for the individual, when there is a statutory right of appeal, or in other circumstances, some form of reasons should be required. This requirement has been developing in the common law elsewhere. The circumstances of the case at bar, in my opinion, constitute one of the situations where reasons are necessary. The profound importance of an H & C decision to those affected, as with those at issue in Orlowski,  B.C.J. No. 1692, Cunningham, and Doody, militates in favour of a requirement that reasons be provided. It would be unfair for a person subject to a decision such as this one which is so critical to their future not to be told why the result was reached. I am of the view that the very serious significance of the abandonment decision for the applicants requires that meaningful reasons be given for the decision. My review of the Board’s reasons in this case lead me to the conclusion that the reasons were not meaningful or sufficient. From the reasons, I am unable to determine why the Board made that decision, as the reasons only state that the claimants did not show that the decision to declare their claims abandoned breached the rules of natural justice. On judicial review, I cannot assess the reason why the Board came to this conclusion as the reason is not stated in the Board’s decision. The failure to provide meaningful or adequate reasons for the decision is a breach of the duty of procedural fairness and therefore the Board’s decision must be set aside and the matter referred to a differently constituted panel for reconsideration. Did the Board fail to observe natural justice in declaring abandoned the Applicant’s refugee claim without having provided advance notice of the specific date from which strict application of the 28 day rule for filing the Personal Information Form would be followed, given the Board’s previous 14 year practice of lax application of the 28 day rule? [para24] I am not prepared to certify this question. The respondent did not propose any serious question of general importance for my consideration for certification. The application is allowed and the matter is remitted to a differently constituted panel of the Board for reconsideration. No serious question of general importance is certified.